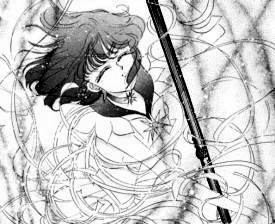 In the manga, however, she transforms just like anyone else.... § In volume 14, when Saturn confronts Hotaru, Hotaru is the one to introduce the Outers to super-senshi status. Hotaru's henshin sparked a bit of taboo. There was a era, which I call the Henshin Conspiracy (about February 1998), whereat this series of images and moving gifs of it were circulating around. Rumour had it this was, indeed, the Henshin of the Silent Senshi. § Don't get me wrong, this was a jewel, a treasure, etc. etc. But I wasn't exactly sure what to believe. If it WAS her henshin, it was a bit of a gyp --we didn't even get to see the fabrication of her fuku. Most respected sites assured us that Hotaru indeed had never been shown to transform (obviously she had to at some point, please don't confuse the context I use. I can be confusing) and though I had seen solitary pictures of saturn which some unreliable sites claimed to be her henshin before, it wasn't a substantial and besides, I wasn't inclined to believe that since I wanted to create my own. § Basically, it came to this conclusion: The Pics are shots from an aol avi file which was her henshin/intro from a SuperS video game. 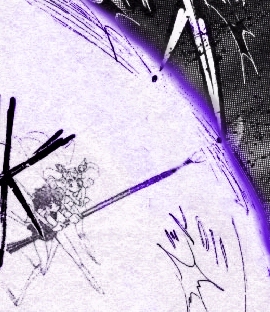 There is an excellent moving gif at Pretty Soldier Sailor Saturn's Homepage.